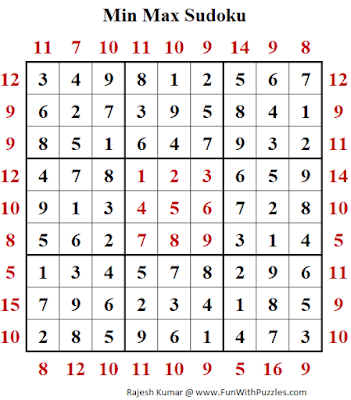 MinMax Sudoku is another interesting Sudoku variation in which sum of lowest and highest number in first three cells is given outside the Sudoku grid. 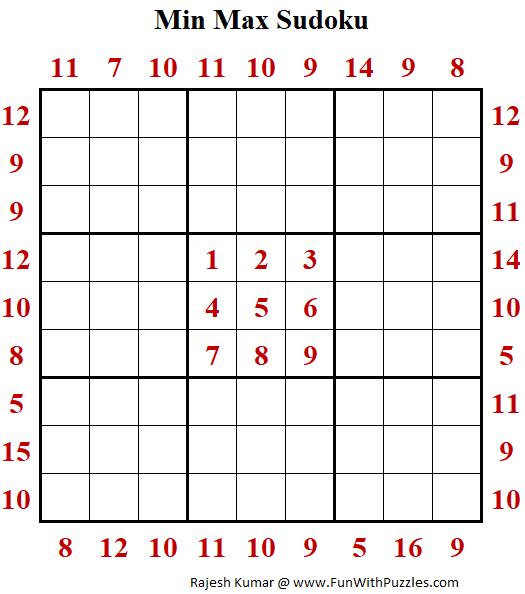 There are few variation of this MinMax Sudoku. One of this variation is called MinMax Difference Sudoku, in which difference of Minimum and Maximum number is given outside the grid. 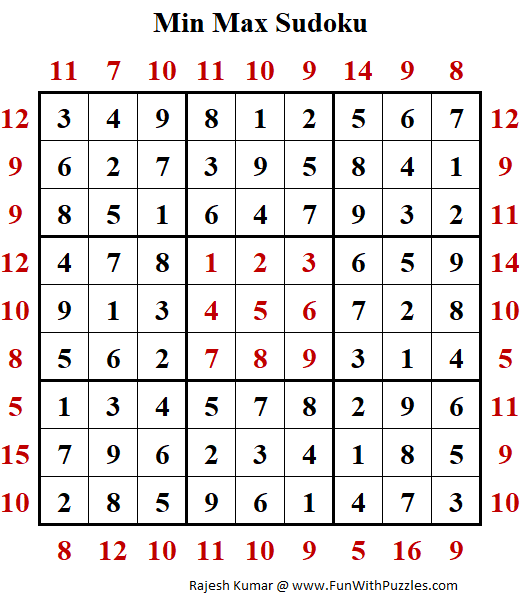 Another similar variation is MinMax Product Sudoku, in which product of minimum and maximum number is given outside grid. Overall all these MinMax Sudoku variations are very interesting. Sometimes these puzzles requires many Mathematically calculations before one can put few initial digits. MinMax Sudoku puzzle, I created for World Sudoku Championship (WSC) 2017 where around 3 Sudoku puzzles, I submitted of MinMax Sudoku type. One of MinMax Sudoku puzzle appeared in WSC 2017 with the similar theme and now I am published one of the remaining MinMax Sudoku puzzle as part of Daily Sudoku League as 215th Sudoku Puzzle in this Series. This MinMax Sudoku Puzzles I am publishing as #215 Sudoku puzzle in The League of Extraordinary Ladies & Gentlemen. Here are the next and previous Sudoku puzzles published in this Sudoku series. There are three different Sudoku Series on the website. One is Fun With Puzzles for which 298 Sudoku puzzles has been published. There are medium level 9x9 Sudoku puzzles in this series. Then there is Daily Sudoku League in which currently there are 215 Sudoku puzzles published. There are mostly difficult level Sudoku puzzles in this series. Currently I am posting one Sudoku puzzle on Thursday in this series. Thirdly there is Mini Sudoku Puzzles Series which contains easy 6x6 Sudoku puzzles for kids. I think this should explain the different numbers assigned to each Sudoku in these series. No Book as of now. I am publishing it only here for free :). Its nice to know that it is helping you. In fact it is reader like you who regularly solve and post their comments motivates me to put one Sudoku everyday :).